Mobitel HSDPA වල හොද කියපු කෙනෙක් හැටියට මෙහෙම එකක් ලියන්න වෙයි කියලා සිතුනේ නෑ. දැන් මාස කීපයක සිට මතකනේ මලින්ත එහම සෑහෙන්න Mobitel HSDPA වලට දොස් කිවුවා. මේ ගැන මම හිතන්නේ මලින්ත Mobitel අයට කියපු වාර ගනනම් කියලා වැඩක් නෑ, නමුත් මේක ගැන පොඩක් වල සොයලා බැලුවේ නෑ. අන්තිමට මොකද උනේ මලින්තත් Dialog HSDPA එකකට මාරු උනා. මතකනේ කාලෙකට කලින් මම මේ Dialog HSDPA හා Mobitel HSDPA ගැන ලිපියක් ලිවුවා, ඒ වගේම මතකනේ මේ HSDPA නොම්මර පෙන්නලා අපිව රවටන ආකාරය ගැනද ලිපියක් ලිවුවා. දැන් මොකද Mobitel HSDPA වලට වෙලා තියෙනේ ? අර කලින් ලිපි වල නරකයි කියපු Dialog තිබූ ආකාරයටම පත්වෙලා. මෙහෙම උනේ ඇයි ? කිසිම infestractrue දියුනුවක් නොකර, තම ජාලයට දරාගන්න බැරි විදියට විකිනීම හා ඉන්ජීනේරුවන්ගේ ඇති අඩුපාඩු. ලොකුම හේතුව මේ මොබයිල් සමාගම් වල, දත්ත හා ගුවන්විදුලි තරංග ගැන සොයාබලන කොටස් දෙකක් වීම හා බෝල පාස් කිරීම. දැනට Mobitel බාවිතා කරන කී දෙනෙකුට එකවර දුර කතන ඇමතුමක් ලාබාගන්න නොහැකිද ? SMS එකක් වත් නොයන වෙලා තියනවා. මේ සියල්ලට හේතුව වන්නේ මේ ජාලයට දරාගත නොහැකි තරම් ග්‍රහකයන් සිටීම. හැම විටම මේ HSDPA වැනි දත්ත සේවාවන් වලට ජංගම දුරකත ජාල වල ලැබෙන්නේ දෙවනි තැන, හැම විටම voice call සදහා පලමු තැන දෙයි. නමුත් voice call එකක් වත හරියට වැඩ නොකරයි නම් දත්ත (DATA – HSDPA) ගැන කවර කතාද? යමෙකුට කියන්න පුලුවන්, මම ඉන්න තැන හොදට වැඩ කියලා, ඒ ඇයි කියන එක මේ ලිපිය කියවීම මගින් තේරුම් ගන්න පුලුවන්. දැනට මම බාවිතා කරනේ මෝබිටෙල් විසින් සපන 3.6mbps පැකේජය. නමුත් දැනට ලැබෙන වේගය ? SLT ලෙස දිස්වන්නේ Mobitel HSDPA විසින් අන්තර්ජාල සේවා සදහා SLT දැ බාවිතා කරන නිසාය. 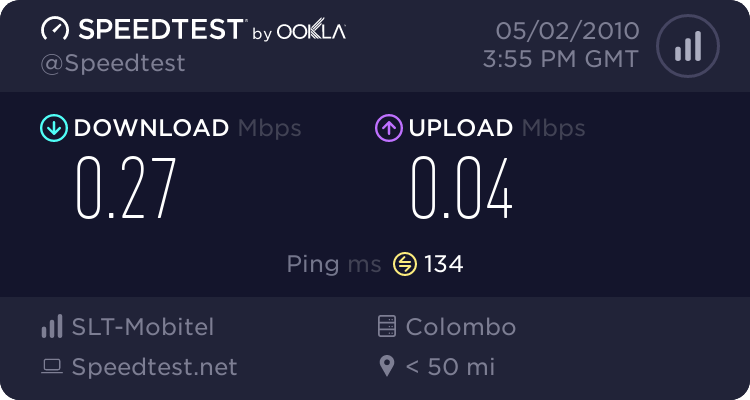 දැන් කියන්න පුලුවන් 0.49mbps උවද ඇති කියා, තවත් කෙනෙකුට කියන්න පුලුවන් International Bandwidth ගැන හරියට guarantee එකක් දෙන්න බෑ කියා. පහත ඇති test එක කර ඇත්තේ Mobitel ජාලය තුලම ඇති FTP Server එකකින් එක දිගට download එකක් කිරීම මගින්. මෙමගින් අන්තර්ජාලයේ ගැටලු හා international bandwidth ගැටලු කිසිවක් බලපාන්නේ නැත. මෙයින් පෙනෙනවා ඔබට දත්ත (data) ලැබීම stable නෑ වගේම සමහර අව්ස්තාවන්හිදී මෙය 0kbps දක්වාද ගොස් ඇති බව. මෙයට හේතුව interconnectivity හා සම්බන්දවන tower (කුළුන) එකට සිටින ග්‍රහකය ප්‍රමාණය දරාගත නොහැකි බව. හරි, එහෙනම් මේ ගැටලුව මට විතරද ? ඉහත දැක්වෙන්නේ පැයක පමණ කාලයක් තුල ලංකාවේ විවිද පැති වල Mobitel HSDPA වල ලැබෙන වෙගයන්, ඔබට පෙනෙනවා බොහෝ අයට අඩු වේගයන් ලැබුනත් සමහර පැති වලට 1mbps වැනි වේගයන්ද ලැබෙන බව. තවද මෙයින් පෙනෙනවා අන්තර්ජාතික (International Connectivity) වලට වඩා ගැටලුව ඇත්තේ ජාලය තුලම බව. ඉහත දැක්වෙන්නේ පැය 3නක කාලයක් තුල එක දිගට Mobitel ජාලය තුලම ඇති FTP server එකකින් file එකක් download කිරීමයි, මෙයි පෙනෙනවා Mobitel HSDPA ජාලයට එක තප්පර 10ක් වත් එක දිගට 548kbps වඩා වේගයක් ලබාදිමට නොහැකි වබ, නමුත් මොවුන් දැන් කතාකරනේ 28.8mbps වේගයන් ලබාදෙන්න, 3.6mbps කරගන්න බැරි අයට මොන 28.8mbps ද ? දැන් අර කලින් Dialog සමාගම මගින් 7.2Mbps කියා නොම්බර විකුනුවාක් මෙන් දැන් Mobitel ද නොම්බර පමණක් විකුනා පාරිබෝගියා මුලා කරයි. ඉහත දත්ත වලට අනුව පැය 3ක කාලයක් තුල download කර ඇත්තේ 157MB ප්‍රමාණයක්, එනම් 126kbps වේගයකි. නමු මෙය විකුනන්නේ 3.6mbps (3686.4kbps) ලෙසයි. තමන්ගේ ජාලය තුලද පොරොන්දුවෙන වේගයෙන් 50% වත් පවත්වාගෙන යන්න බෑ කියනේ කිසිම වාදයක් නැතුව එක ජාලයේ ඇති දෝසයක් මිස අන්තර්ජාතික සම්බන්දතාවේ දෝසයක් නොවෙයි, මෙයින් කියන්නේ නෑ අන්තර්ජාතික (international) bandwidth වල ගැටලුවක් නෑ කියා, එයට වඩා ඇත්තේ ජාලයේ වැරදියි. දැනට Mobitel HSDPA ජාලය ලංකාවේ ඇති පහලම ජංගම අන්තර්ජාල සම්බද දෙන සමාගම බවට පත්වෙලා, මීට වඩා Airtel ද, Mobitel HSDPA වඩා 100% ඉදිරියෙන් දැන් Dialog ද සිටියි. කෙනෙක් පැමිනිල්ලක් කල විට මීට වඩා අවදානයක් යොදා එම ගැටලුව නිකන්ම කුනු කූඩය නොදමා එය ගැන සොයා බැලුවානම්, Mobitel HSDPA තවත් ඉදිරියෙන්, නමු දැන් සිදුවී ඇත්තේ තමන් සිනා උන ජාලයටද දෙවැනී වීම පමණයි. Dialog ද පෙරදී මෙම වරදම කරන විට Mobitel පැවසුවේ අපි කවදාවත් එහම නොකරන බවයි, නමුද දැන් ඩයලොග් තම වැරදි හදාගෙන මොබිටෙල් වල තියන ගැටලුද හදාගෙන ඉදිරියෙන්, දැන් Dialog HSDPA පාරිබෝගිකයන්ට Dynamic Global IP එකක් සෑම කෙනෙකුටම සපයයි, Mobitel HSDPA තවමත් අර යල් පැනගිය Private IP (NAT) යොදාගනියි. අපි පෙන්වූ සුලු ගැටලු වන File Download කිරිම හා එකම Global IP share කිරීමේදී ඇතිවන ගැටලු පවා දැන් Dialog HSDPA නිරාකරනය කර ඇත. ලෝකයේ ඇති හැම test tool එකක් බාවිතා කරලත් තමන්ගේ ජාලය ගැන සොයාගෙන්න බැරි Mobitel ඉන්ජිනේරූ මහත්වරුන්ට දැන් අපිට ඔවුන්ගේ ජාලවල ගැටලු අපිට සොයන්න වෙලා. මේයට හේතුව test tool හදපු අයගේ වරදක් ද නැත්නම් ඉතින් …. ? මේ පොස්ට් එක ලියන වෙලාවේ මම ඉනේ නුවර, මට Mobitel HSDPA වලින් speedtest එකක් කරන්න තරම් වත් speedtest.net වෙබ් අඩවිය වැඩ කරනේ නැ. නමුත් මෙන්න Dialog HSDPA නුවර වේගය. You said Dialog didn’t Increase the price. No, that’s about the absolute price. But you have forgotten that they introduced Rs.3000 package with 7.2Mbps and they dropped the speed to 1Mbps (after customer complaints) in early 2009 WITHOUT a price Drop. Ideally they should have dropped the price and reimburse their customers who paid them a higher rental. So as i said, the parameter ‘Price per Bandwidth’ is now increased. It’s an increase of Relative price. any one would be happy with a connection that works, rather then a connection that dosent. i didnt see any one complain about dialog making it 1mbps, but i do remember every one was complain about the 7.2mbps that cant even do 400kbps and that was not stable. people dont really check the speed, even i dont, all we want is when we go the web page, for it to show up, not our connection to get disconnected or show page not found or half loading pages. also, now all dialog connections can do 7.2mbps as they have lift the limit. It is POSSIBLE but NOT GUARANTEED. because it is Mobile Broadband. Operator Advertises the Max speed. In other words they tell you, ‘You can’t go above 3.6Mbps’ or ‘You will always get something below that speed’. So any customer with a common sense should realize what does that mean. 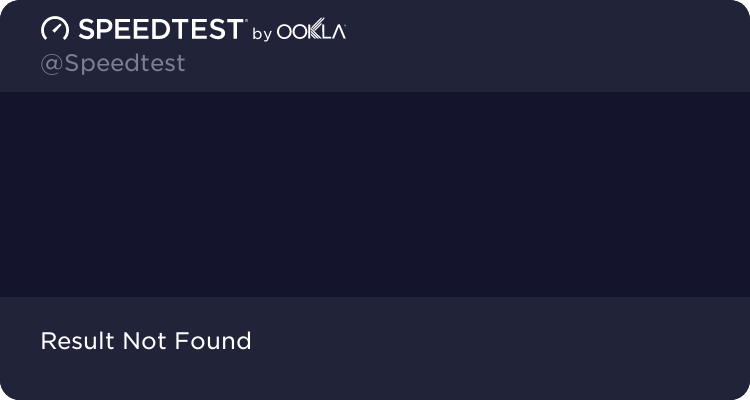 well, if it was 30% deference i would understand, but what when your getting only 40kbps on a 3.6mbps connection ? what if when the connection disconnection every 5 mintion, does that also understandable by the common sense ? most HSDPA towers can do 14.2mbps, if they advertise it says 14.2mbps, thats just dumb advertising, the realty would be 2mbps. Next argument, What happens if Mobitel drop their Max Speed to 1Mbps. (i believe they can do it without a price change comparing the prices of Dialog Rs.3000 Vs Rs. 1290 for same speed + Mobitel giving additional GBs)? Yes, now you will be happy coz they Advertise correctly. Plus you will get a reasonable speed close to 750-1000 kbps. But what does that prevent you ? It will prevent you that your speed go above 1Mbps during network NON BUSY HOURS/LOCATIONS. ( For example, at my location i get speeds of 1Mbps-2.5Mbps Randomly specially late night to morning and may be in afternoon until 8pm). But i will not be happy if Mobitel drop the speed to 1Mbps as it cause to loose my Max speed. yes, i would and other will be happy as well, rather then having a so call 3.6mbps connection that cant do even 300kbps stable for 10min. its seem your the only one who’s getting 2.5mbps on mobitel, since i have been using this for quite some time and around Sri Lanka, only place i got 2.5mbps was in Colombo. yes mobitel was better in the past not now, maybe 1 or 2 lucky people may get good speed, but out that all mobitel users 90% of them are not getting good speed. check above the speed test i have done around the county, only 2 locations has pass the 1mbps limit. see how many people has told they are not getting least 1mbps. i dont see any 2.5mbps any where. im happy with a 1mbps stable connection, then a hyperthetically 3.6mbps connection that do 1~2.5mbps on given locations on once in a blue moon. Im some one who travel, thats why i need a HSDPA, thats why im seen the true picture of this. Also i DON’T WANT to pay Rs.1700 EXTRA to Dialog just to get 1Mbps speed + with a LOW data volume. So better if you reconsider what do you really expect from the operator ? There are many ways they can give you a better speed. thats you coz your getting good speeds as you say, what about the reset of the people who are not even getting 512kbps ? do you know when i was in Kandy, i only got 50kbps even tho i was on HSDPA and it was disconnection every 10min ? do you know its still the same ? i dont have to say mobitel is good coz just one person is getting a good service, if would says its good when least 90% of the people getting a good connection. Mobitel use to be better and Dialog was bad, but now the tables has turn. i dont really need 3.6mbps, all im asking for a 1mbps stable connection, that i can at least watch youtube or brows the web with out getting disconnected every 10min. I have never seen this kind of a feedback from users !! Ela !! Just took these speedtests from home. Got a call saying they’ve fixed it so I thought it would work properly now. mama nam oya dekama pavichchi karanawa oya leda seramath thiyena wa. monawa karannada. appiwa danuwath karanawata thnks. kalinga ayya mobile partner eke daily,monthly,yearly used karapu data pramanaya bala ganne koho mada. මේ lanka education & research network එකේ download & upload speed එක මිනිත්තු 5 කදි වෙනස්විම ඈයි මේ විදියට වෙනස් වෙන්නෙ මේ වෙනස් විමට හේතුව (international) bandwidth ප්‍රශ්න නිසාද නෑත්නම් network problems එකක්ද? Any specific areas (physical locations) that u guys feel for Dialog need further coverage/quality improvement? Hey, in our area-Gampola Dialog 3G coverage is weak.No signals shows in mobile partner.But speed is pretty good – above 1Mbps most of the time.If the signal strength can be further improved it is better.. The answer must be whole Srilanka!!! ah mobitel HSDPA ela ela mata ewaseema purudu kare oya magula thamaye. hebeye mata 1ka davasak RED LINE penala dongal 1ka …… aprde mage dongal 1ka. Hi. im using Mobitel Upahara internet package (1 mbps) through my mobile phone (w760 hsdpa). im getting almost over 100KBps at day time. but at night its damn slow sometimes goes to 10KBps or even less!. and the speed is not even either it fluctuates rapidly. and the other thing is it gets disconnectes automatically within very short periods. Does anyone facing the same problem here?? not only you, must Mobitel users face that issue. not only that they also experience frequent disconnections as well. I am also now tired of informing this useless customer care service several times by all the possible ways (calls, emails). But instead of improving the conditions are worsening day by day. Initially when I bought this connection about a year ago the performance was amazing. I almost always got a very stable, minimum of 1.4Mbps speed without any disconnection issues. Situation was gradually changed and from about 3-4 months it started to have very poor speed at night and frequent disconnections. But from recent days this frequent disconnection also occurs in the day times as well! There is some reduction in indoor 3.5G signal levels also. If this deterioration is going to continue in this rate I am pretty sure this connection is going to be totally unusable in another few months. And there web site also has problems. Once, because of a fault in their online payment gateway I had to pay Rs.4000 instead of Rs.2000. And from recent days their my account section in totally non-functional so now there is no way to check my data usage. I am really sad to see our so-called national mobile partner has deteriorated to this level. මම මාධ්‍ය අායතනය වැඩ කරන්ෙන්. ෙමාකද කියන්ෙන ෙදන්නද මාධ්‍ය භාවිතා කරල මුන්ට ෙහා‍ද ෙග්මක්. Me too switched from dialog to mobitel some time back. I was happy with the speeds for a while and now it is almost useless. Average round trip time i am getting is longer than 3 seconds. Hi Kalinga & everybody.. Mama use karanne Airtel unlimited HSDPA package eka. (1.8 Mbps) Use karanne Rathmalane. Mata hariyata uththara dan nathi prashna 2k thiyenawa. Please puluwannam udaw karanna. 1. Meka 1.8Mbps kiwwata online internet brows karaddi enne 300kbps withara. (Ex- Youtube 1 vid 1k baladdi uparima speed eka 250-300kbps withwra wagw thamai enne) Eth IDM use karala monawahari download karaddi 1.6-1.7-1.8 Mbps wage enawa. Ekama connection ekedi download waladi speed 1 wadi wennai, online brows karaddi speed 1 adu wennai hethu monawada ? 2. Meken Rapidshare, Megaupload, etc… wage site walin download aranna giyama static IP nisa mara awla, koi welawakawath download karaganna be. Ithin mekata mokakhari karanna deyak nadda ? Very true Anuradha. It is said that none of the mobile companies in SL will be able to recover massive investments they make on 3 G. They are having to invest just to retain in the highly competitive market is SL. Our broadband tariff is lower than even India. No wonder why companies are trying to absorb more customers as possible to mitigate their losses. Me too used Mobitel earlier on and switched to Dialog due to problems with Mobitel connection. So far Dialog is quite good even in highly residential areas like Dehiwala. After all there is no major difference in each others’ prices. So to me Dialog seems to be a better option. machan uba kiana kathawa sahathika aththa. man use karanneth Mobitel Dongal ekak. mata dan me jarawa wisik karannath hithenawa. eth machan meka wisik karala aimath Dongal ekak ganna tharam api Salli karayo newei. dan ithin eka dongal ekak gaththane. dan ithin karanna deyak na. Mobitel ekata bana bana indala wadakuth na ne. eh nisa Apita me jarawe Download speeed eka wadi karaganna widihak kiala deepanko!! loku udawwak. aiyo me computer eke sinhala kit eka naha ne mamath oya hama ekakma use karala baluwa eeth mata uneth nikan kalakanniyek venna eeth call ekak ganna signal nathi Dehiattakandiye DIALOG 7.5 Nathi Unath 3.6 Valatanam vada thiyenawa pic ekak upload karanna bari una ekata sorry eeth Maha lokuwata sri lanka telicom kiyaganna Mobitel ekata thama Dehiattakandiyta GSM signal ekak vath denna bari ai???????????? aiyo me computer eke sinhala kit eka naha ne mamath oya hama ekakma use karala baluwa eeth mata uneth nikan kalakanniyek venna eeth Mobitel call ekak ganna signal nathi Dehiattakandiye DIALOG 7.5 Nathi Unath 3.6 Valatanam vada thiyenawa picture ekak upload karanna bari una ekata sorry eeth Maha lokuwata sri lanka telicom kiyaganna Mobitel ekata thama Dehiattakandiyta GSM signal ekak vath hariyata denna bari ai??????????? ?